Six Stories is very different from any book I have read recently and that made it a really intriguing read. The author, Matt Wesolowski, was kind enough to write a guest post for my blog recently and you can read that by clicking here. Six Stories takes the format of a podcast series investigating the mysterious death of teenager Tom Jeffries twenty years ago at an outward bound centre in the fictional Scarclaw Fell. Over six episodes we hear about what happened from the points of view of six of the people involved: four other teenagers, one of the group leaders and a local man who had befriended the group. I have to admit, I’m not really familiar with podcasts but I know that they are very popular and that one in particular, Serial, follows a similar format to that portrayed in the book. It involves an investigative journalist following a story over several episodes. In Six Stories, investigator Scott King interviews six people who were among the suspects at the time of Tom’s disappearance. Other than a few questions, clarifications and asides from him, the only words we read are from the interviewees themselves. The story is told almost entirely through their answers. The reader is very much invited to be judge and jury throughout this book. Scott King offers no interpretation of what might have happened or if he thinks anyone is to blame. He is simply presenting the facts as told by those he interviews. The dynamic of the group of teenagers is fascinating. The death of their friend has obviously haunted them for years but how much did each know and could any of them be responsible in any way? They seemed to me to be just your average group of teens, rebellious in their own ways through their clothes or by drinking and smoking. They certainly didn’t seem like bad kids though had, of course, their petty disagreements and jealousies particularly when it came to the relationships between the boys and the girls. The storyline looking at the myths and legends concerning a mysterious creature roaming the fells was intriguing. I’m sure any of you who has been away on a school or youth club trip has had the experience of being scared silly by stories like this, to the point of being almost convinced that the danger is lurking and very real. All the stories refer to this legend and you begin to wonder if there could be an element of truth in it. 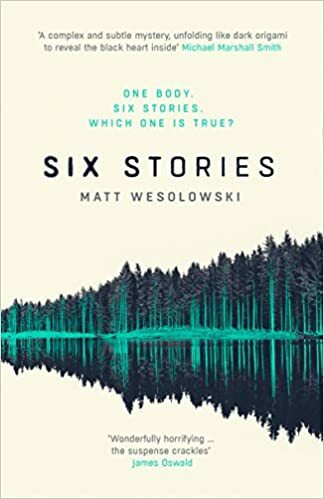 Six Stories is a terrific mystery story, well-written and full of suspense which builds up slowly throughout the book until the final chapter when I couldn’t turn the pages fast enough. The stripped back story meant that I had to draw my own conclusions on what had happened and the rights and wrongs of the actions of those involved. It’s a really unusual book which I found very compelling, with the author creating a rather ominous atmosphere throughout. 1997. Scarclaw Fell. The body of teenager Tom Jeffries is found at an outward bound centre. Verdict? Misadventure. But not everyone is convinced. And the truth of what happened in the beautiful but eerie fell is locked in the memories of the tight-knit group of friends who took that fateful trip, and the flimsy testimony of those living nearby. 2017. Enter elusive investigative journalist Scott King, whose podcast examinations of complicated cases have rivalled the success of Serial, with his concealed identity making him a cult internet figure. In a series of six interviews, King attempts to work out how the dynamics of a group of idle teenagers conspired with the sinister legends surrounding the fell to result in Jeffries’ mysterious death. And who’s to blame… As every interview unveils a new revelation, you’ll be forced to work out for yourself how Tom Jeffries died, and who is telling the truth. A chilling, unpredictable and startling thriller, Six Stories is also a classic murder mystery with a modern twist, and a devastating ending. sounds like a must read Joanne! Great review.